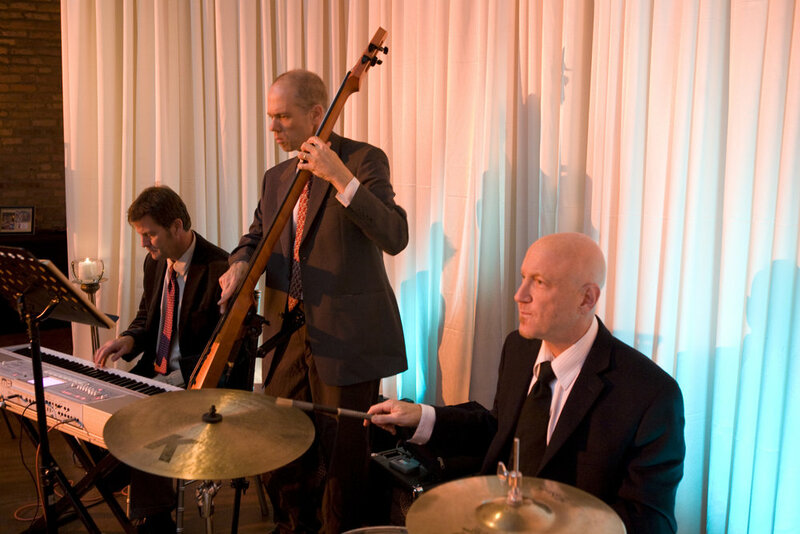 Art of Imagination is our choice preferred full-service event production firm. 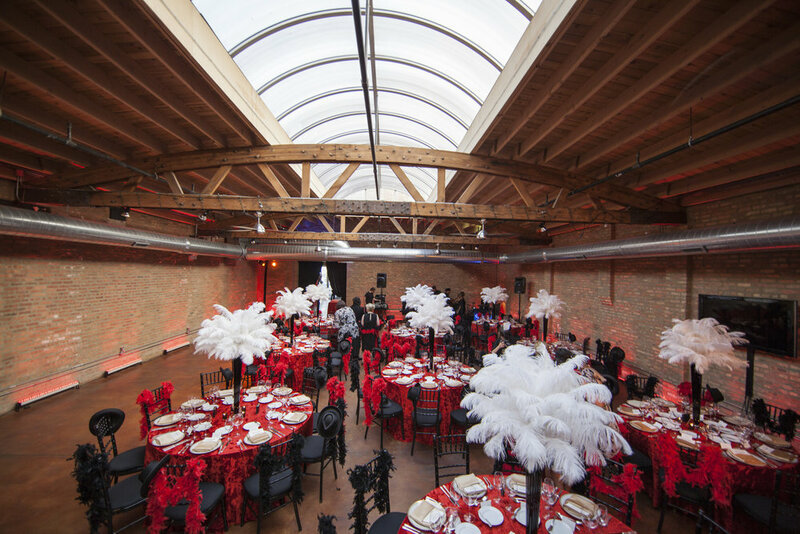 Weddings, private events, corporate events – Art of Imagination is perfection when tasked with transforming our space to achieve a visually stunning reveal of your vision. 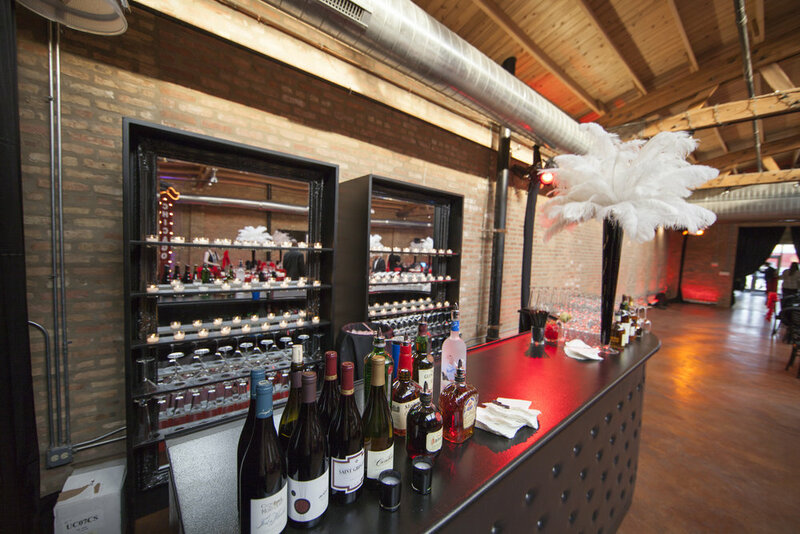 Incorporating event decor in Loft on Lake's 'Grand Loft' space, the cocktail room and transition hallway are the three key areas Art of Imagination works their magic! 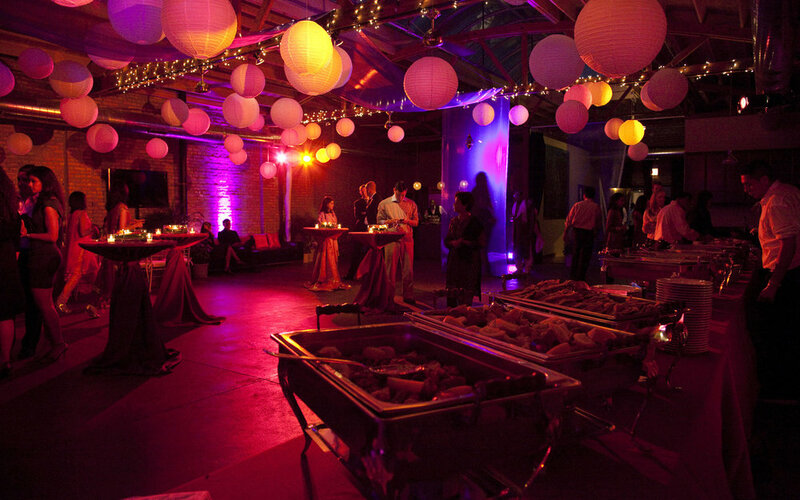 The Loft's urban yet intimate feel can become vibrant with color or softened with neutral draping, lighting, natural elements and interior design. See below for some of AOI's most popular services utilized here at Loft on Lake. Reach out to Art of Imagination today for an inspired consultation! The most stunning and the most popular look – 40- ft. width of elegant crepe-back satin fabric, pleated 5 to 1 fullness. A perfect complement to the skylight that softens the space. Made of three sections total, the middle section can curve and have additional swags of fabric at the top. 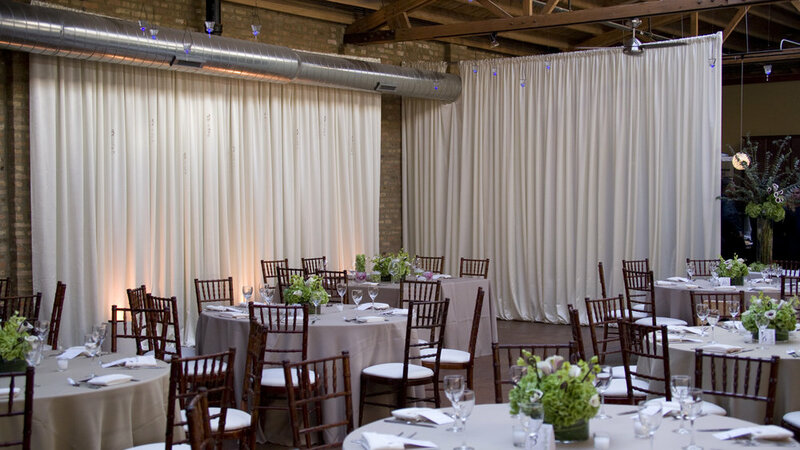 The backdrop can swag open revealing voile drapes in the center or crisscross in front or to swags throughout as other options. 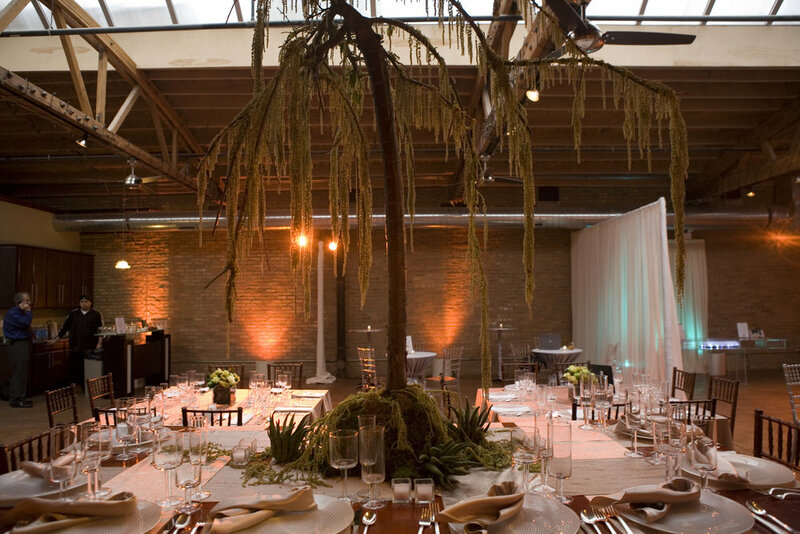 The backdrop will shimmer with 2 up-lights in a candle-lit color wash in a diffused white creating a soft illumination. One side section of the drape will swag open for access to back bathrooms. After the ceremony, the Bride may choose to keep any section of the draping up for sweetheart table, or to block view of catering area. Pricing includes staff to come back to strike after the ceremony for the room flip. AOI can add white café globe lights in the center of your backdrop for extra illumination. We can also interweave fresh greenery. 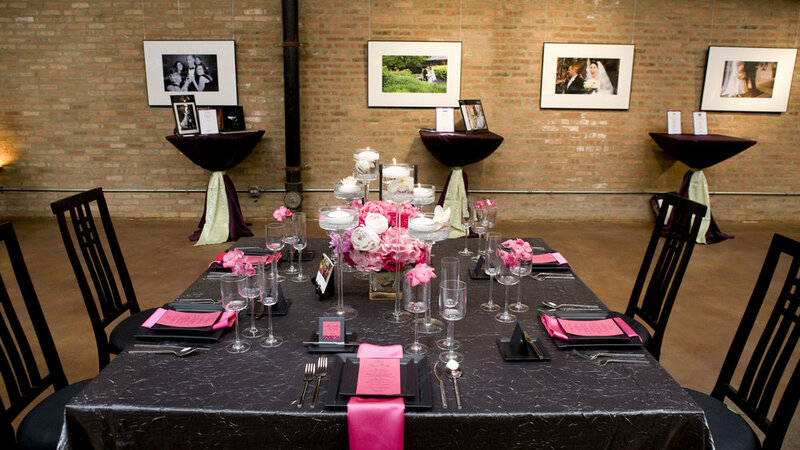 We design the perfect Drape to match the Bride’s style and wedding dress. 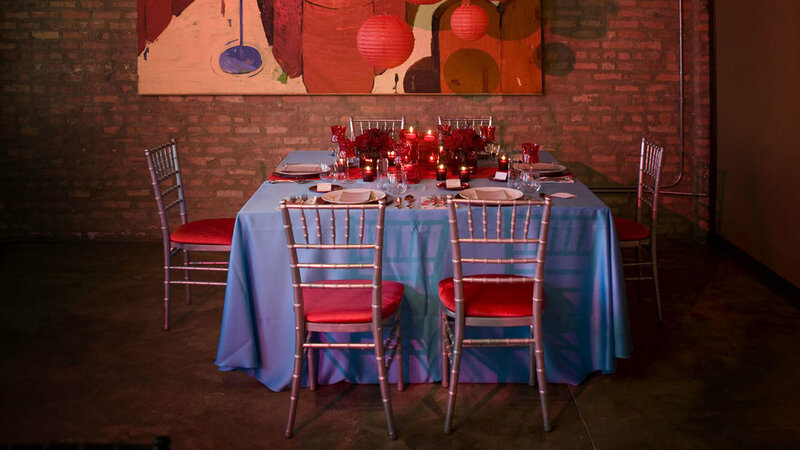 Drape also functions to hide the pre-set dining tables. (2) Lucite columns will be placed at the altar for the florist to place arrangements on. In the back corner, two pin spotlights (wrapped in fabric to conceal) will wash the aisle with golden candle-like glow and later, repositioned/adjusted to add a glow to the dance floor. This lighting is necessary for evening ceremonies and ideal for wedding photography! A custom designed draped structure to be created and selection of luxury fabric from crepe back satin to semi sheer voile. Fabric can be swaged open with an array of cuffs from fresh greenery to crystals to silk. Overhead sheer Japanese crystal fabric gently swaged above will create the canopy. We can also add any family heirlooms to the design. All four sides will be up lit with mini diffused white lights for glow. Additionally, a crystal chandelier can be hung within chuppah structure for an elegant look. 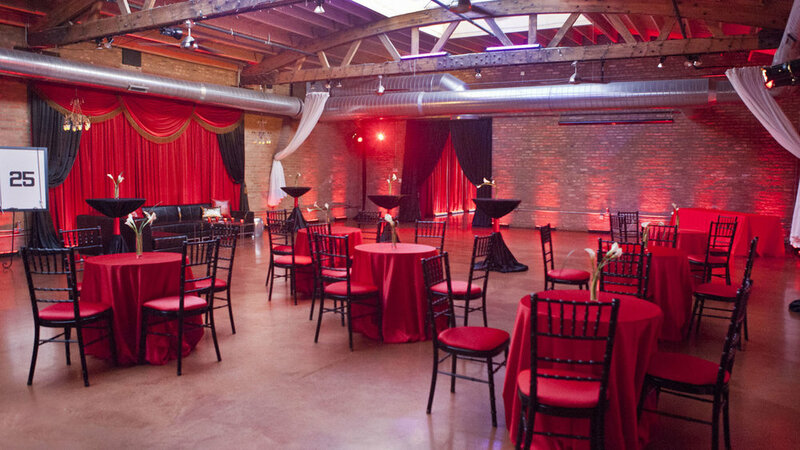 The warm colored brick wall will be illuminated with a vertical backdrop with 350 café globe lights on dimmers for that perfect visual as the bride begins her walk down the aisle and later, the backdrop for dancing… enchanting! Add fresh climbing greenery interwoven within for extra enhancement. Loft on Lake's entryway is rustic urban and elegant with the exposed ceilings and brick, permanent chandeliers and lots of light - it's a lovely space to dress up! AOI can add draping to cover walls for a cohesive soft look. AOI specializes in spacial placement of rented furniture and decor items. In the front room Lounge on a brick wall, a smaller version of the globe light backdrop, approx. 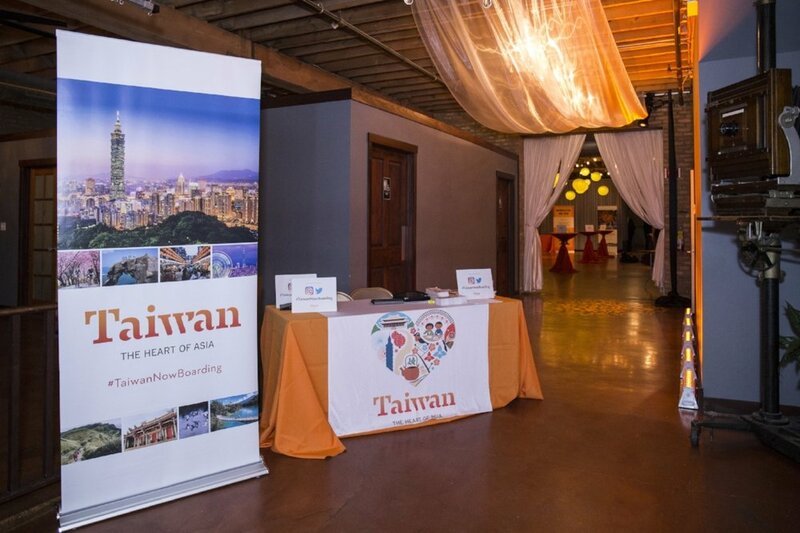 10 ft. X 9 ft. is the perfect backdrop and creates a beautiful bokeh effect in pictures! For the most-dramatic and vibrant lighting, we will place LED light-strips on the timber truss beams, flooding the skylight in a color of your choice. 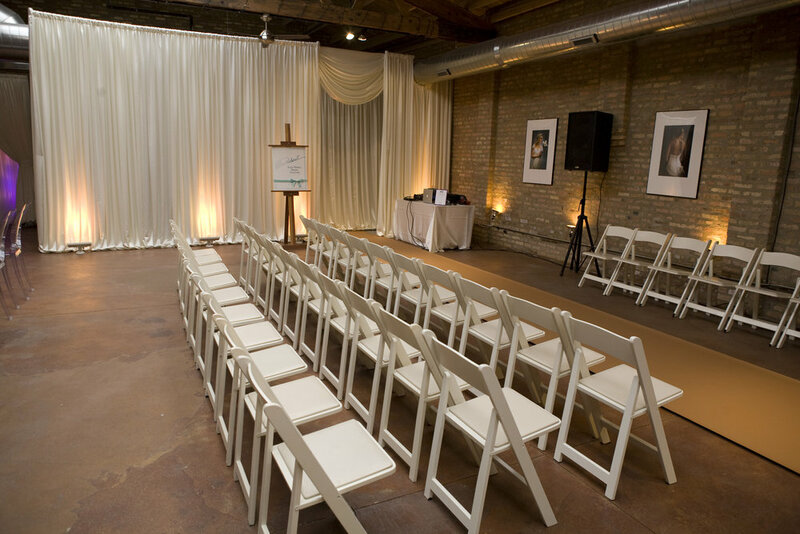 A white or ivory linen 5 ft. wide fabric aisle runner down the aisle from altar to last row of chairs. Select from a variety of chandeliers. The Grand Loft has a hook centered on each truss (3 total) for easy installation down the center of the aisle! Three crystal chandeliers, each to have to 13 electric candles, over 50 drop-down crystals and 350-crystal beads adding that wonderful sparkle for the ceremony aisle. For a more nature inspired vibe, AOI can create an array of different arch structured designs from natural branch arches with fresh greenery, to adding interwoven mini fairy lights for that extra sparkle. 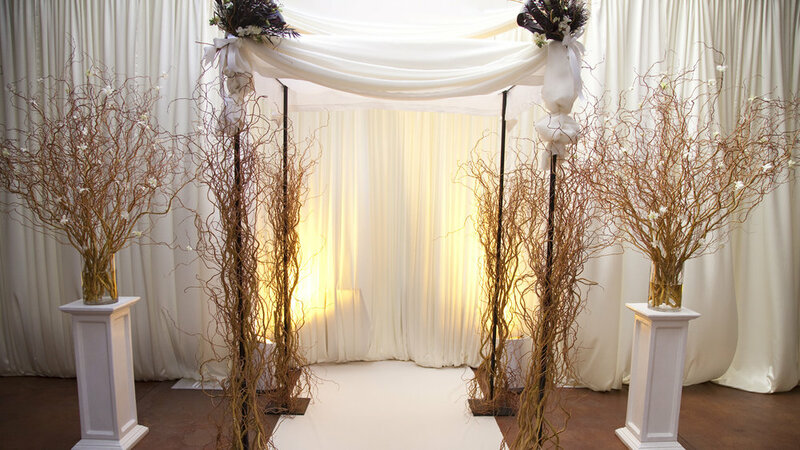 Arches are handcrafted using branches, lights, greenery or florals to add something rustic and natural for this profoundly special moment! When the room is flipped to reception, a portion of the ceremony arch can stay up to act as a backdrop, which can be moved during the flip! Floating tea lights hung from the ceiling with fishing wire is a beautiful decor element that adds an unexpected dreamy feel. When looking up the tea lights twinkle like the night sky. 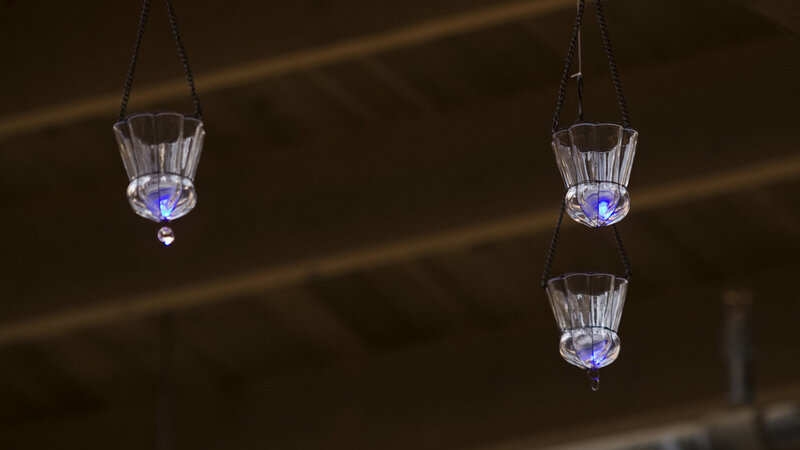 These lights will be strung prior to ceremony and reception for guests to enjoy through the duration of your wedding. For a beautiful natural , hanging 'floating' florals and greenery from the timber truss beams creates stunning altar decor above your ceremony area. A 5ft. round halo will be designed with an array of fresh seasonal greens for that perfect enchanted look. Great for over the alter to later be repurposed for the Kings table or sweet heart table. Variations available from rectangles to lattice and adding hanging Edison light bulbs or candles for additional. 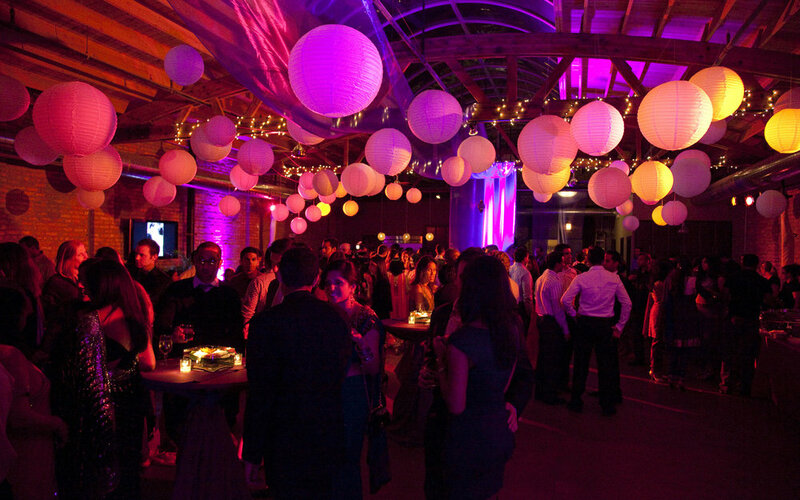 Paper lanterns (with or without lights) to hang with fishing wire from above in different areas throughout the space. Select from different styles and shapes. When the room is flipped to reception, a portion of the ceremony drape can stay up to act as a backdrop, as well as the arch, which can be moved during the flip. To add that magical feel underneath the skylight, AOI will add beautiful swags of 550 café globe lights creating an illuminated canopy above. Add fresh climbing greenery interwoven within for that extra enhancement. 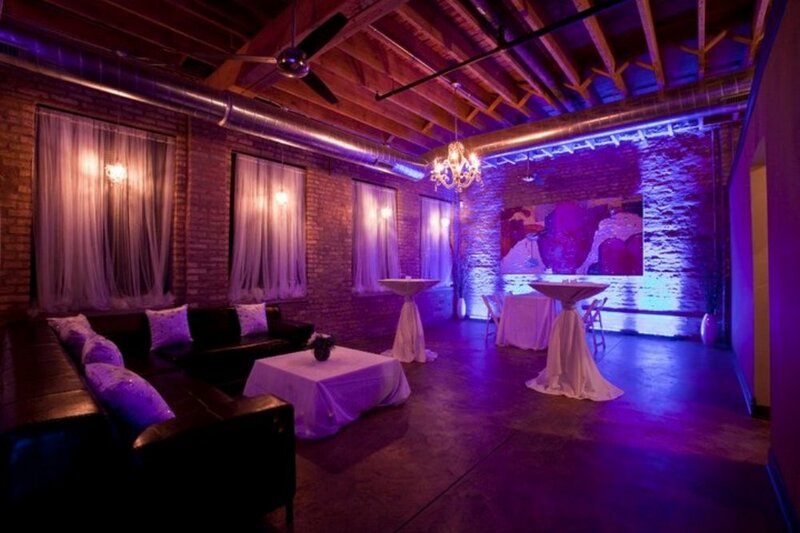 We will place 10 LED light strips on the dance floor behind the Band/DJ along the south-west corner walls to wash the brick in a vibrant color of your choice. To expose only the large granite countertop island for food, dessert or coffee serving during your event, AOI can drape around the kitchen cabinets. This is done with higher guest counts when all reception square footage is in use. Add a sheer, iridescent fabric panel going the length of the foyer hallway, or along length of skylight along timber beams to absorb LED for more color and drama. The walls will look amazing with 8 wireless LED light bars as up lighting in a soft candle light glow or vibcolor of your choice. You also can add more LED or light poles to the entire room with the same glow. 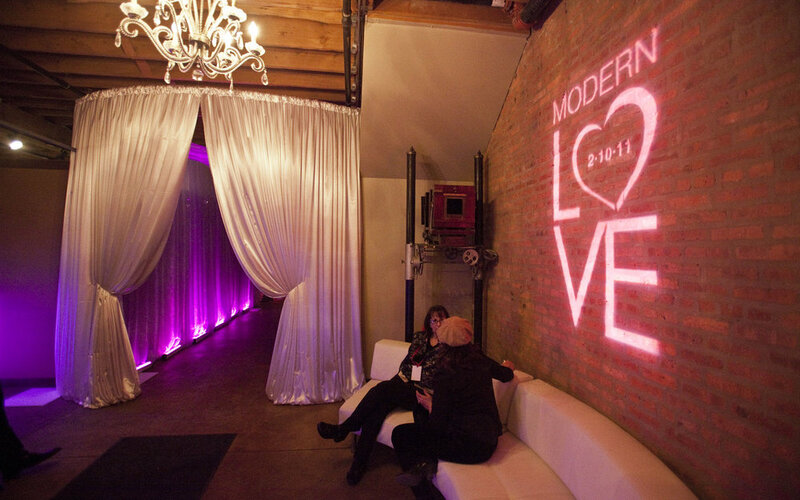 Walls and floors are dramatically lit with custom designed monograms, logos and additional designs (available upon request) Two (10 ft.) light poles covered in fabric each with one source light and gobo pattern. For a custom feature on the dance floor, AOI will project the pattern of your choice from our collection for another layer of the lighting… magical! 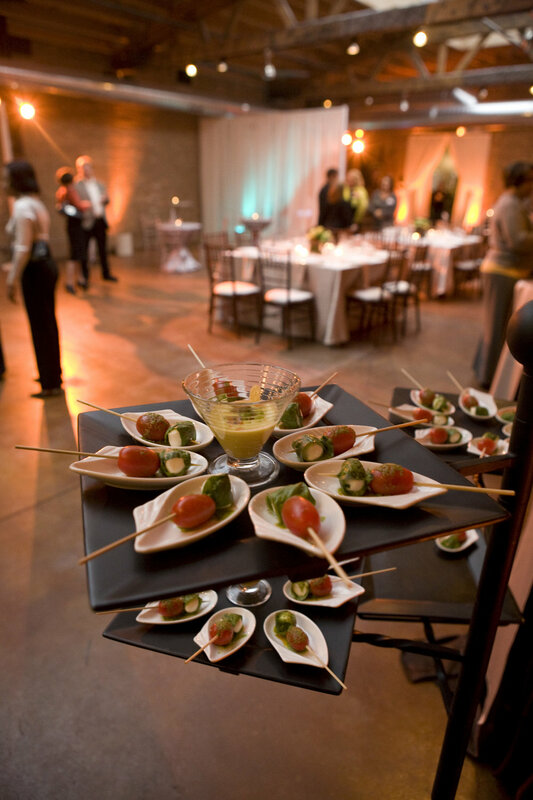 Corporate events are a great opportunity to completely customize the space to reflect your brand and theme. AOI can take on any custom look! The walls will look amazing with 8 wireless LED light bars as up lighting in a soft candle light glow or vibrant color of your choice. You also can add more lights to the entire room. Add a sheer, iridescent fabric panel going the length of the foyer hallway, or along length of skylight along timber beams to absorb LED for more drama. Art of Imagination will add 2 or more panels of draping for fashion shows for a dramatic entrance and create a staging area that conceals for backstage. 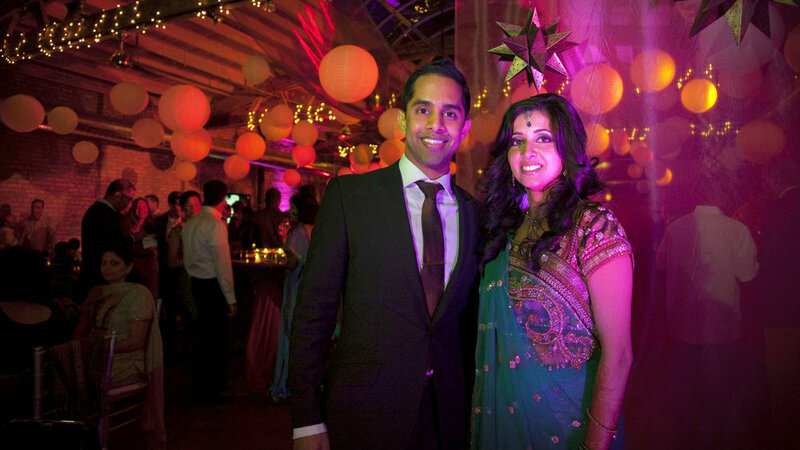 Walls and floors are dramatically lit with custom designed monograms and designs. 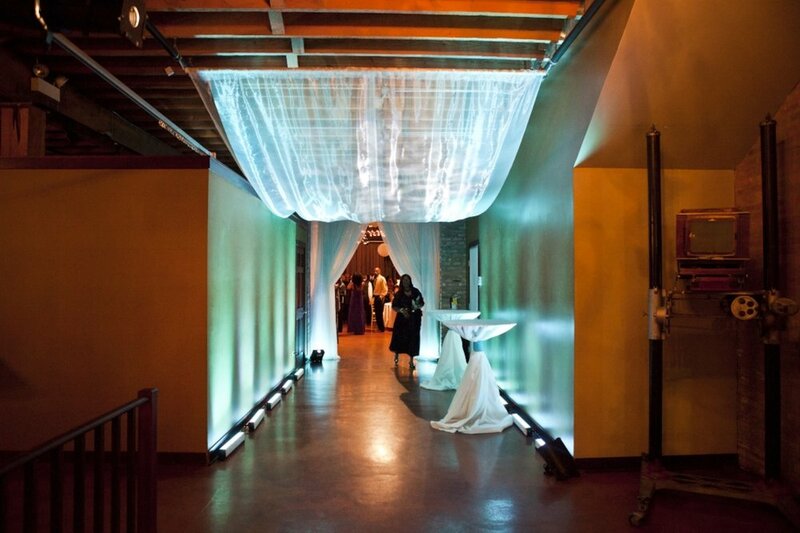 Two (10 ft.) light poles covered in fabric each with one source light and gobo pattern. For a custom feature on the dance floor, AOI will project the pattern of your choice from our collection, your branding or a create a customized design. The creative mind behind Art of Imagination, Deborah Weisenhaus oversees the event production process from start to finish. Tuning into the clients’ visions to creative impactful and functional designs. With a Masters Degree in Fine Art, Deborah designs with vision, creativity and sees functionality as the corner stones of every project. Deborah has been a valued vendor and friend of Loft on Lake since the start. She knows the space inside and out, and has consistently brought joy and success to our clients for these special occasions. Having her on-site on the day-of is so beneficial and special because of her attention to detail, confidence and calmness, taste level and execution! Inquire about Art of Imagination's breathtaking wedding structures; chuppahs, fabric aisle runners, asian lanterns, globe lights, greenery and endless event design & production services. Wedding Coaching, Spacial Design, Interior Design and more.